“The Price Of Gold” is all about people changing their lives. There are different ways for people to change their lives. Sometimes people have to change their lives because life changes. Isn’t it annoying when someone just says the same thing over and over again? It’s a bad habit of the Once Upon A Time writers, and David H. Goldman continues to smack the audience over the head with a theme, but “The Price of Gold” is actually the best episode of the series thus far. There’s a fair share of forward momentum for the story and Jennifer Morrison gets a lot of screen time, but the biggest improvement is in the flashbacks, as Rumpelstiltskin takes the spotlight for a revised Cinderella story. Last week’s episode gave a us a different version of Snow White and Prince Charming’s courtship, but there wasn’t a big twist to any of the essential elements of her story. The Evil Queen, Huntsman, and seven dwarves never appeared in the flashback, focusing instead on a mangy Snow White flirting in the woods and fighting some trolls. This week’s flashback begins with Cinderella (Jessy Schram) sweeping as her stepfamily goes to the palace ball, and when her Fairy Godmother appears, Rumpelstiltskin incinerates her to get his hands on her magic wand. The familiar fairy tale is no longer so familiar, and the flashbacks are suddenly a lot more interesting. Prince Charming (I’m probably never going to refer to him as James) and Snow White are also brought into the mix, and seeing how the characters intersect and affect each other reveals the storytelling potential in the flashbacks. Gold hires Emma under the pretense that she has stolen something from him, but he proves to have more devious intentions than just getting back the child. The dark curse used by the Evil Queen was given to her by Rumpelstiltskin, and it’s entirely possible he’s the bigger bad on this series. Hopefully that’s the case, because Robert Carlyle is giving us a much more dimensional villain in Mr. Gold than Lana Parilla’s Regina, who continues to be a caricature. Maybe because she’s aware of her true self she doesn’t need to hide under a façade of humanity? Or maybe the writers don’t know what to do with her. Carlyle turns up the camp considerably as Rumpelstiltskin, but it works specifically because of the quiet menace he brings to Mr. Gold. And then there are moments when Rumpelstiltskin goes from ham to horror, like his scene after Cinderella’s prince disappears. Sitting in a cage with wide eyes, he shrieks, “In this world or the next, Cinderella, I WILL HAVE THAT BABY!” Suddenly he’s not an imp, but a demon. And he’s angry. My opinion of Henry remains the same, and he’s around for most of the episode as Emma deals with her mommy issues. When Regina tries to run Emma out of town by exploiting her nomadic past, Emma decides to lay some roots in Storybrooke. Goldman finds a clever way to connect the Henry/Emma scenes to the flashbacks by turning their detective adventure into Henry’s Cinderella story, complete with last-minute shoe drama. Henry spends the perfect day with his mom, and when he runs upstairs to be in his room by the time Regina gets home, he leaves a sneaker on the stairs. 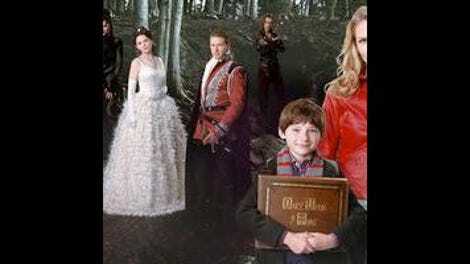 It incorporates the big dramatic moment of the fairy tale into Henry’s story, and Regina yells at him for leaving his shoes on the stairs, but otherwise his day has a happy ending. He might be on the nose, but Goldman does strong work showing the juxtaposition between reality and fantasy in a less contrived way than last week’s episode. Combining the Cinderella and Rumpelstiltskin fairy tales creates a coming-of-age morality tale about a girl that gets everything she wants, but is punished for not accepting the consequences of her actions. As Cinderella is punished for her actions, Emma is beginning to forgive her own, and decides to take a more active role in Henry’s life. After deciding to keep the baby, the father of Ashley’s child comes to her hospital room to see his newborn daughter, Alexandra; sometimes fairy tales end badly, and sometimes reality can turn out better than fantasy. There haven’t been many Fables parallels in the last two episodes, but this week has a big one: Emma’s new job. In Fables, Snow White is the deputy mayor of Fabletown, and Sheriff Graham offers Emma a deputy sheriff position this episode, which she accepts. We don’t have confirmation that Graham is the Big Bad Wolf beyond his tracking abilities and facial hair, but if he is, that makes him Sheriff in both stories as well. (Just saying all this because everyone that is reading this should go buy Fables, available from Vertigo/DC Comics in trade paperback, hardcover, and digitally.) Sheriff Graham is also the subject of this week’s wonderfully soapy cliffhanger, revealing that he’s flirting with Emma but sleeping with Regina. I wasn’t expecting the series to go in that direction, but any relationship development is going to help get these characters into more interesting, complex situations, no matter how forced those developments may be. I just hope they don’t waste the opportunity for a really obvious “he’s a dog” joke. Cinderella isn’t very good at sweeping, reading over contracts, or fake crying. The signature blue dress from Disney’s Cinderella. Ruby’s wardrobe, hair, and makeup is absolutely ridiculous. She’s quite a skanky Red Riding Hood. In the fairy tale, the Prince will do whatever’s needed to save his child. In real life, he can’t even stand up to his dad. Henry is reading an issue of Ultimate Hulk Vs. Wolverine, written by Lost co-creator Damon Lindelof. 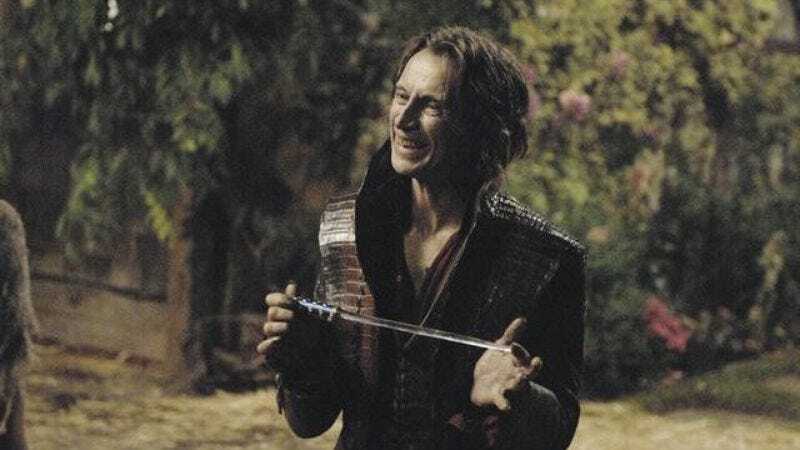 Robert Carlyle has some rough teeth, and that’s before the Rumpelstiltskin makeup. “Stepmom, stepsisters, and she’s a maid.” It must be really irritating to Emma when Henry is right. Most groan-worthy line this week: “There are no fairy godmothers in this world.” Yeah, we get it. In two weeks: a Henry spotlight, because that’s what everyone really wants.